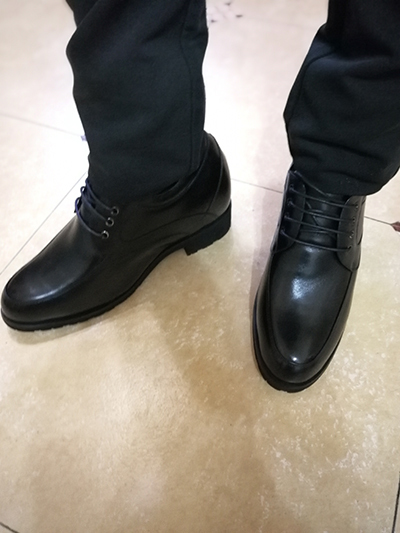 12 CM Elevator Shoes High Heel Men Dress Shoes that Give You Height 4.72 Inches, men taller shoes make you stand taller and more confidence. These shoes are definitely of a lighter construction compared to my other high heel shoes and boots. Materials and construction quality are excellent. Took two wears to break in for my slightly wider feet, and no issues with fit. I stand at my desk all day and have found these to be my favorite pair of shoes around the office! Very comfortable shoes with great style. I would recommend a half size larger than what you typically wear because of the taper from the midpoint to the toe. (My feet are a bit tight at the toes which has been fine but may not work for everyone.) Overall a perfect pair of shoes. I’ve had a lot of elevated shoes and boots over the years but these are my favorites by far. Comfortable, stylish and well made. I wish they were available in brown color as well! So despite having to pay some additional charges upon delivery to Ireland I’m really delighted with the shoes. In fairness, it’s what I would expect for the price but they are extremely supportive and very comfortable. It is a big investment compared to other elevated shoes but given that I spend so much time on my feet it is a very reasonable cost. I couldn't be happier with these shoes. The quality exceeds expectations and they look great! Five stars! This is a beautifully made shoe and we have received wonderful customer service. I purchased them for my son who is aged 21 and 5.4 feet - and he is very happy with the style and comfort. He says it gave him more confidence at university. Thank you! The insole pad wasn't as soft as my other pair as well, but was good enough. Overall the shoe seemed very comfortable upon wearing around the house. Color is exactly as shown on the product page. I would recommend it with 3 stars. 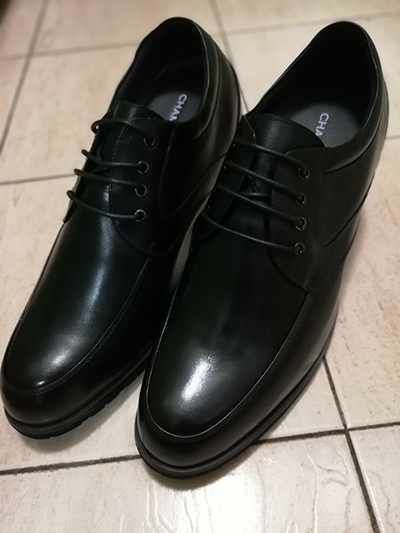 As the title says, I purchased a pair of these a few months ago and they were so comfortable and well made that they became my go-to shoe for the office. I would recommend for anyone who is looking for a great quality shoe that truly is more comfortable than any shoe on the market. Great shoe, comfortable, maybe slightly bigger than what I would expect for my usual 10 size. I've only worn these a couple times so far, but they were comfortable from the moment I put them on. They feel like they will be durable and long-lasting. I liked the shoe so much that I brought two pairs of it. If your feet is wider than regular, please go for the bigger size. Initially, it might feel tight but over the time it will adjust. 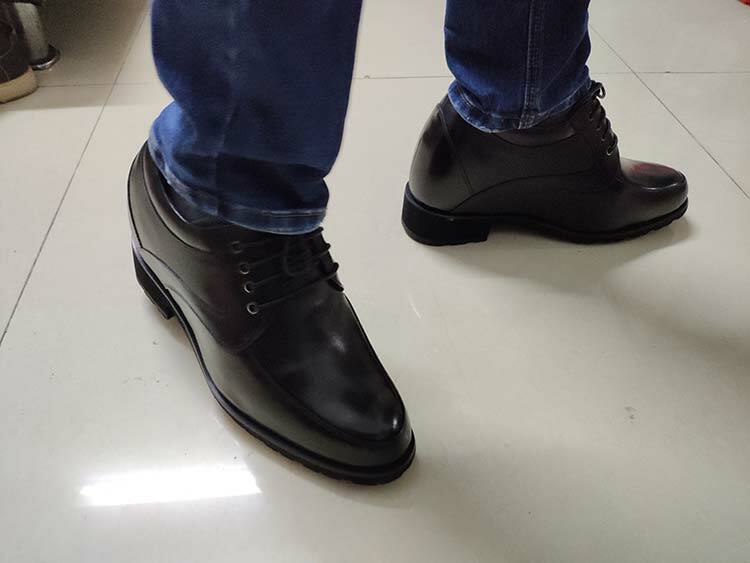 Comfortable, smart, probably one of the best dress shoes with hidden heel that you can effort! Somewhat large at the tip of the shoe, but they're comfortable on my wide feet and Chamaripas brand seems to run large anyways in elevator shoe industry. I will likely buy wood sole shoes next time but these rubber soles are great for the price I paid! Everything is just as advertised regarding the comfort level of these shoes! I bought the Chamaripa in Black. They are absolutely gorgeous shoes! The leather and construction are top-notch, and the material is high grade. I have read a coupe reviews that have stated them being uncomfortable,. I have not had that experience. I wear a 10 & mine fit spot on. Read the all the positive reviews but still assumed they would need some breaking in first. Nope. They have been great since day 1. I wear mine about 2 to 4 days a week. I’ve now had this pair for just over 4 months. They are definitely my favorite dress shoe that I own, which is why I just placed an order for my second pair. 5 stars! The shoes are amazing, but I also wanted to get a matching color shoe cream and they have been out of stock for nearly 3 months on any of sites that I have come across in google. Come on guys get your act together and also making matching shoe cream with your shoes. Its hard to find suitable color in market. Firstly I mention its worth $189 because of calf-leather it has used. I got extra elevation of around 10 cm and its not hard on my feet. I would say outstanding, comfortable right out of the box and the fit is perfect. I would give it 5 stars! These shoes feel better than other elevated shoes I have worn in past. I’m used to dress shoes feeling like walking barefoot on concrete and these feel like a dream in comparison. They fit my foot well, feel great, and look fantastic. I would recommend these shoes. These are by far the best all around all-round dress shoes! The are the perfect mix of comfort and style which is impossible to find. I've purchased two pairs and I'm going back for a 3rd. I would recommend these shoes to short men for all day use. Its light and comfy. Super comfortable and lightweight shoes. So far, excellent. The shoes look great and feel really good. Initially I was a bit concerned about the time needed to break the shoes in. However, I am very happy to report that it was truly a breeze. The shoes fit nicely from the first time. Read all the positive reviews but still assumed they would need some breaking in first. Nope. They have been great since day 1. I wear mine about 2 to 4 days a week. I’ve now had this pair for just over 4 months. They are definitely my favorite all time shoe that I own, which is why I just placed an order for my second pair. I’m usually a cheapo when it comes to clothes and shoes but these are well worth the cost. 5 stars! It gave me extra height of 12 cms. These are by far the best all-around dress shoes! They are the perfect mix of comfort and style which is impossible to find. I've purchased two pairs and I'm going back for a 3rd. Outstanding, comfortable right out of the box and the fit is perfect. I was initially skeptical and read numerous reviews before pulling the trigger on purchasing - elevator shoes for a relatively unknown and unlikely claim!? After 2 months I can say these have become the most comfortable and most worn shoes I own. Thanks dudes! I'm a motivational speaker and life-coach. My height has always been matter of embarrassment in major public events that I take. But such shoes save men like us from such situations. God bless. 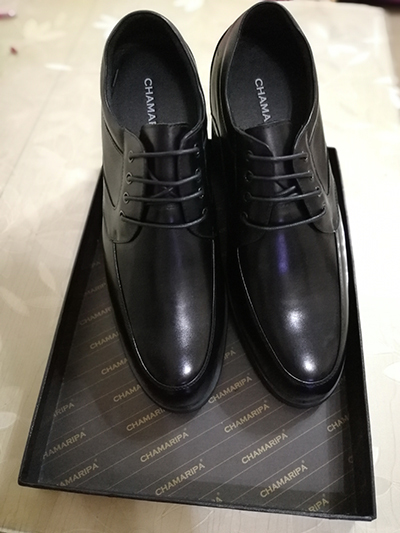 I recently purchased one of the expensive styles shoes from chamaripa for my wedding in September. They are probably the most beautiful pair of shoes I have ever seen. I love the quality of the craftsmanship, and the smell of them are intoxicating. Thank you guys for making me look so damn dapper on my big day. Choose it online for my fiancee for the casual days before our wedding day. Great looks and style! Only wish there was a wide size for it. Well made comfortable and elegant shoe that fit perfectly utilizing the “size chart”. Returned the shoe only because I needed a jet balck color (would order the chamaripa again if it was available in black bullet pebble grain). Based on the quality of this shoe I ordered another style in jet black. The ordering, delivery and return process was seamless. Initially purchased the wrong size; recommend using website for sizing recommendations by the shoe. The return took a long time; but customer service was helpful and shoes are very comfortable right out of the box... I will be purchasing more from Chamaripa! I liked the solid rubber insole that is used in the shoes. I have ordered extra pair of insole after using it for a month. It looks great...fits great...feels great. I would give them 5 stars and recommend it to anyone who wants to look taller on special occasions. Super stylish and very comfortable. Shoes arrived promptly, packaging was more than adequate. The fit was accurate and they were comfortable right out of the box. Most favorite part is shiny calf leather that is used. Wish chamaripa came out with more styles! Extremely comfortable once broken in and received many compliments - overall, a great pair of height increasing shoes, recommend it! 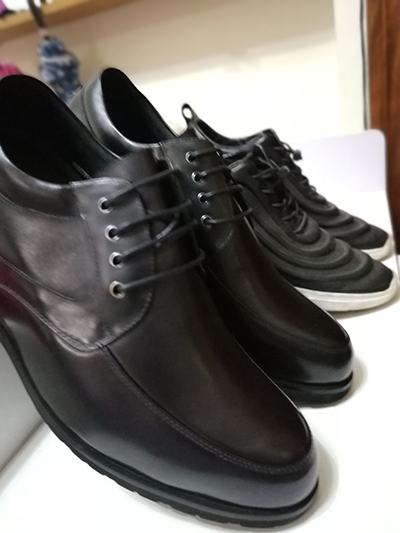 I have been a regular user of height increasing shoes for men and I must say I was lucky I came across this brand who exclusively deal with hidden heels for men. I must say they are very nice, comfortable shoes, with a lovely texture of leather. Looks great with jeans. I’ve worn them to work, with slacks and would recommend it. I have never been a fan of heeled dress shoes. I like how they feel, but not how they look. This is my first pair of height increasing shoes, and I don't think I can go back! These are so comfy that I actually look forward to wearing them. I will give them 5 stars! I was skeptical about the textured leather at first. But they look great and I get lots of compliments on them. While I love the fit and comfort, I'm also convinced the quality of the leather is on par with competitors in the same price range. All in all I highly recommend these! 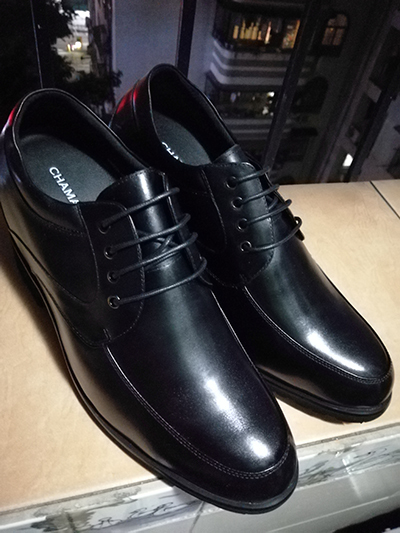 This is my fourth pair of Chamaripa shoes but my first pair of their 12cm extreme height. (The others are all less elevated.) As with all there footwear, they are lightweight and feel more like running shoes than traditional dress shoes. I would give them 5 stars! Firstly, I must mention I liked the help provided by customer care for choosing these shoes for me. They listened to my requirement peacefully which helped me in choosing the right piece for myself. All day, every weekday, these shoes exceed all expectations for comfort. I bought these high heel in black after being bombarded by facebook ad’s from the brand for months. The shoes looked handsome and I had to satisfy my curiosity. Im happy to say they’ve well exceeded my expectations. They are easily the most comfortable shoes i own, are extremely handsome, and match well with a ton of outfits. Plus the website and shopping experience was very smooth and easy. Five stars! I OWN 3 Pair and are totally satisfied with the fit, and comfort of the shoes. They seem well made, and stylish and gives me good posture and height. Also they are lightweight which elevator shoes are usually not. It's not just marketing. These shoes are "ridiculously comfortable". They are well made, and the attention to detail and overall quality with height is worth the higher price. I can see them lasting for a long time. They do not fit well with the lifted heel. Also they looked old too quickly, just after a couple of use. Wouldn't buy or recommend again. The quality of this shoe is great, but for me, it ran a tad bit bulky look. I am a fan of this brand and was excited to order this. But this one was just a little bit old fashioned than my other, but might be due to the design and I should have chosed different style. Overall very nice in style and fit, but the stitching is unfinished inside at the upper strap attachment and creates a bit of discomfort. I had to scissor this excess thread material out. A bit taxing and need to be addressed. I hope customer care will listen to my issue sincerely. All the posts are true. This pair of shoes is the mist comfortable dress shoe I have ever owned. It feels like you have a pair of running sneakers or flat heel on. Very stylish. Clearly worth the cost if you want a dress shoe with the comfort of a running shoe!! The mens elevator dress shoes looks good. I Will buy again from this brand. Great mens high heel dress shoes. Fits great and comfortable, am going to get another pair. The shoe looks extremely good.I Will buy again from this brand.